There is a saying a picture is worth a thousand words. If that is true, a video must be gospel. The saying is old, but so is the concept of a photograph — an image captured by film then applied to paper. Today photography is digital. And because of that advancement, it allows for manipulation. Image retouching is supposed to show the best, natural you. We are moving beyond image retouching. Placing a likeness of you in a digital video environment is supposed to give the scene or event a better representation than a photo. Digital manipulation of the human form in a video was the domain of high-end digital processing suites. The outcome of this type of editing is what we expect to see in science fiction movies. The high-end barrier has broken. AI (Artificial Intelligence) is now creeping into photo editing and video production at the mid-level processing suite. The average designer and developer now have access to these tools. Believing your eyes and ears is going to be a challenge. Believing your eyes and ears is going to be a challenge. The media is talking about fake news. The fakes are now synthetically-real. 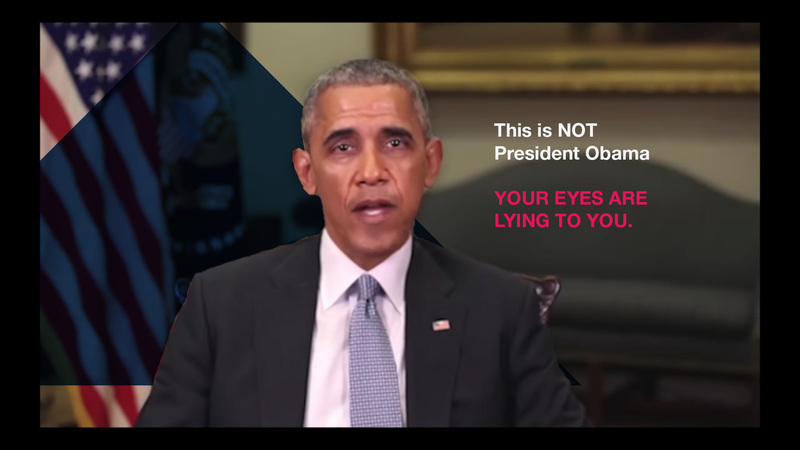 There is a proof of concept video with President Obama saying things that only your knowledge of the former President would make you question statements you see on the screen and hear him saying. Watch. The new saying might be, "Don't believe your eyes or ears, they are lying to you." Think of a character that was digitally made to look and sound like you. Then imagine that droid saying things contrary to your personality. After capturing your likeness, AI manipulates the code to be convincing —speaking patterns, blinking eyes, even twitching. A basic form of this AI technology is employed in photo processing and video production by your average designer and some mobile apps. Companies like Adobe are working on the synthetic voices. Now, consider the application of AI in marketing and communication. We may have the ability to create that perfect spokesperson, synthetically. Or create a fake person to manage standard customer care enquires. For example, Google is trialing its calling AI. Take a look. Again, don't believe your eyes or your ears.